So writes poet Brent Hendricks in his new memoir, “A Long Day at the End of the World.” It’s a book that ferries readers from this world to the next courtesy of a modern-day Charon who passes the time by debating the meaning of life and death. Not only is it a journey into the heart of Hendricks’ own personal darkness, in prose as gorgeously ghoulish as a Hieronymus Bosch painting, but it’s quite possibly one of the most hallucinogenic, Southern Gothic road trips you’ll ever take. The story begins with a version of Hades found right here in Georgia: the grounds of the Tri-State Crematory in rural Walker County, on the day in 2002 when authorities arrived to discover hundreds of uncremated and decaying bodies — one of which would turn out to be that of Brent Hendricks’ father. Within days, investigators unearthed five years worth of crematory operator Brent Marsh’s bizarre handiwork: corpses in pits, strewn in the woods, some stuffed into metal vaults in storage sheds, a few bulldozed into the ground “like speed bumps.” Hendricks’ father was identified by his custom-made boots, and the family reeled as the news painted a more gruesome picture every day. In 2004, Marsh was tried and convicted; to this day, he has never broken his silence about the case. In 2005, the state razed the site of the crematory and placed the property in trust, to remain in its natural state in perpetuity. With a photograph of it in hand, Hendricks set off to revisit his father’s final resting place. For Hendricks, the signs are everywhere, and his memoir catalogs them in lyrical profusion, pulling in a virtual kitchen sink of Southern culture and biblical imagery as he travels through Alabama and Georgia, with nods to medieval alchemy, “environmental ruin,” the travels of explorer Hernando de Soto and a host of American desecrations that spin out from the crematory to the genocidal treatment of Native Americans, the brutal institution of slavery and the battlefields of the Civil War. 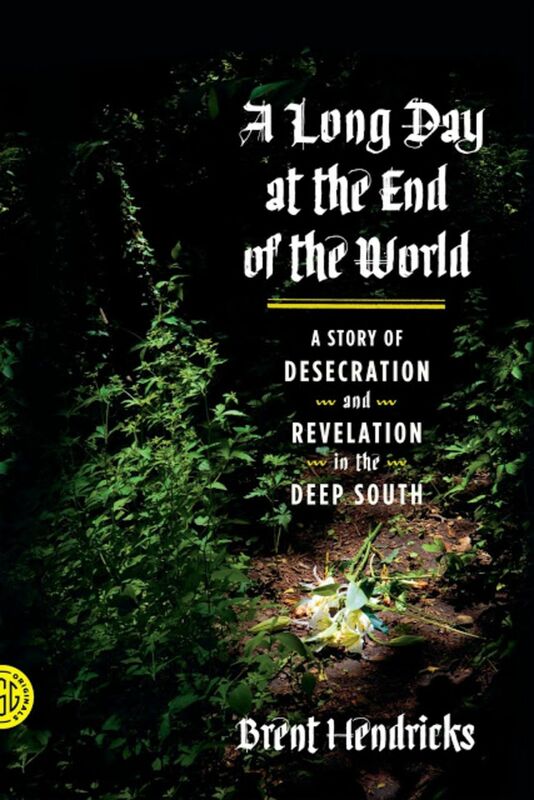 Closest to the author’s heart — to his predisposition to apocalyptic thoughts and his “doomsday excitability” — is the ample roadside evidence of the End of Days, Tribulation and Revelations. Into this dazzling array of ideas linked to his mission, Hendricks weaves his family history, including moves from Oklahoma to Connecticut to Atlanta in the 1970s and his father’s hardscrabble childhood. He cites a curious family household god responsible for egregious examples of bad luck, including the fact that his mother’s burial phobia led to the exhumation of her husband’s body, which was then sent to Tri-State. Despite its heavy cargo, Hendricks’ ferry navigates the Styx without capsizing, the far reaches of his imagination and memory creating a powerful current that propels the reader through a metamorphosis that parallels his own. His skillful imbedding of the daily developments in the Tri-State case grounds the narrative, providing a counterpoint for the larger, more poetic vision. Like those seekers before him, the further Hendricks travels toward his destination, the more inward his search and the more personal his “private apocalypse” becomes. His desire to reclaim his father’s soul equals his hope for “a new kind of End-Times living that would not draw me away from this world but would bring me back here.” At the end of this long day at the end of the world, all are ferried safely to shore.